A novel attraction for a window display can be made of a piece of plate glass neatly mounted on a wood base, and an electric light which is placed on the top edge and may be lighted apparently without any wire connections. 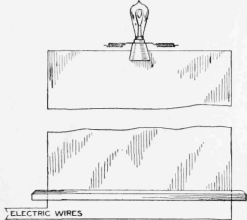 The method of concealing the connections is to paint the edges of the glass green, then, before the paint is quite dry, lay on a thin strip of copper, making the connections at the base on both sides, and to the lamp in the same manner. Another coat of paint is applied to cover the strip. The color should be an imitation of the greenish tint of glass edges. Any desired lettering can be put on the glass. - Contributed by O. Simonson, Brooklyn, N. Y.